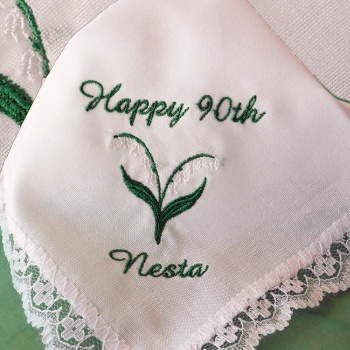 A lovely floral lace trim personalised handkerchief featuring Lily of the Valley flower motif. Ladies white cotton lace trim handkerchief embroidered with a pretty lily of the valley flower. Embroidered in green and white. Just fill in the options boxes with a name or brief message. Choose the font style you prefer. Please enter the exact wording you would like.